Built in the early 1970’s, the Water Pollution Control Plant Northside Facility in Danville, Virginia is responsible for treatment of both domestic and industrial waste. This facility has the capacity to treat up to 24 million gallons per day. 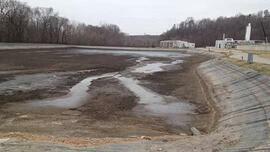 In 2009, the existing 325,000 SF treatment pond, lined with unsupported PVC, had deteriorated beyond repair and needed to be replaced with a new liner system. Stimulus money earmarked for high priority projects in Virginia allowed the Northside Facility to evaluate various options in order to completely reline the 7.5 acre pond. The design firm, Dewberry Engineers, selected the technology of a high performance, reinforced geomembrane: XR-3®. XR-3, based on XR technology utilizing EIA (Ethylene Interpolymer Alloy), was chosen for its long-term performance in wastewater facilities. XR-3 geomembranes consistently demonstrate a high level of superior UV and weathering resistance in the harshest of climates. The reinforced 30-mil XR-3 provides higher strength properties than unsupported geomembranes that are over twice as thick. Finally, in an effort to minimize field seams, Dewberry Engineers specified large prefabricated XR-3 panels, up to 20,000 SF each, for the installation.